Submitted by Simon Coleman on Sat, 21 Feb 2015 - 17:11. The first of the three main aims in the footpath enhancement plan is to turn this neglected area into a visually attractive and colourful place. To create an immediate impact with plants, I recommend using selective native cornfield annuals. One benefit of using annual plants is that they will grow quickly from seed within one year. Another important benefit of these plants is that in the long-term these species will eventually die out unless the soil is annually turned over. This will avoid competing with local native plant species which we aim to introduce over a longer term basis and also any detrimental effects created by the introduction of aggressive plants species. I recommend a simple wildflower meadow mix containing Corn Poppy, Corn Marigold & Cornflower. 1. They have a simple attractive colour mix, red, yellow and blue. 2. They will grow in local soil conditions. 3. These species evoke a nostalgic feeling which we aim to encourage within the users of the footpath. 4. The opportunity to source these seeds from a current plot holder who has been growing and collecting seed for the past three years. The second aim I would like to achieve is the creation of wildlife habitats. There are opportunities along the 360 metre length of path to create habitats for birds & insects like Woodpeckers, Frogs, Stag and Devil’s coach horse beetles, Butterflies, Moths, Wild Bees and Wasps etc. All of which have been seen on the allotments. 1. The creation of vertical wood piles dug into the soil to create a feeding environment for Stag beetle larvae and a host of other insects that are associated with dead wood. 2. The creation of winter nesting sites for various insects including wild bees, wasps and flies. 3. There are also opportunities to continue to grow local native plants that benefit butterflies and moths for both larval and nectar sources. These will also serve for the less popular but equally important pollinators of the Fly family. These plants include Stinging nettle, Red clover, Ragwort, Dandelion and Buttercup to name but a few. 4. The continued and managed growth of shrubs and dead wood provides food source, nesting sites and shelter for a variety of birds, including Green Woodpeckers, Gold Finches and Jays. The final aim of the footpath Enhancement Plan is to reintroduce local native species into this footpath area. There is currently over 20 identifiable native plant species growing along its length (see table below). It is our aim to reintroduce more locally sourced native plant species. 1. 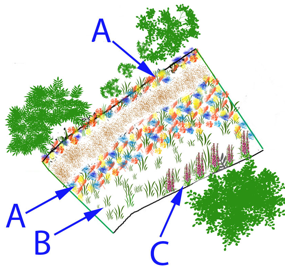 Create a “Local Wild Plant haven” with ever increasing species diversity. 2. An increased diversity of insect populations from the expanded plant species. 3. Allow for the creation of genuine local native plant seed for sale or distribution to interested parties. It is proposed that a selection of native plants not found locally will be added to the footpath these species will be selected for their benefit to insects and for their aesthetic qualities. These plants will include Wild Foxglove, Giant Mullein, Dark Mullein, Weld, Lords and Ladies and Teasel. The path has been surveyed by Christina and Simon. The whole length and width was measured and divided into zones according to the amount of light in each section and the prevailing species already growing along the path. 1. The removal of rubbish including plastic bags, wooden boarding, metal, glass bottles etc. 2. The removal of plant & shrub debris, this material can be used to create compost or be burnt to create nutrient for the allotment or pathway. 3. The turning over of the top 8 inches of Topsoil to create conditions for annual seed growth. The removal or ‘digging in’ of leaves from the topsoil. 4. The cleaning of the tarmac path, with either a yard broom and water or jet spray. The levelling of soil on the outer edge of the path to reduce dirt build-up. 5. 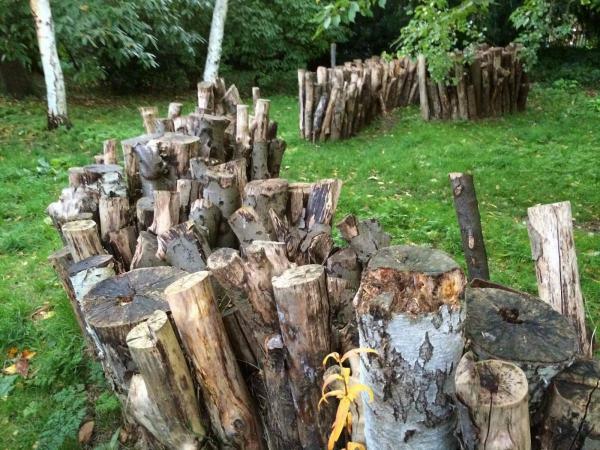 The creation of vertical wooden piles inserted into the soil will create feeding areas for Stag beetle larvae. 6. The drilling of varying sized holes in dead tree stumps will allow a range of bees and flies to overwinter in the holes. 7. The continuation of ‘Stinging Nettle bars’ will serve as a food source for various butterflies and moths. These bars can also include other currently found wild plant species. 9. The introduction of native plants not known in the local environment including Wild Foxglove, Giant Mullein, Dark Mullein, Weld, Lords and ladies and teasel that will enhance the environment for Humans and wildlife. 11. Contacting environmental organisation who can help and add to the knowledge and resources of the Footpath Enhancement Plan. 12. A long term plan to create a seed bank of these locally found wild plant species will be organised by EDAS. The seeds could be sold or given to interested parties. 13. Contact the Ealing Borough council to inform them of the land rights, enhancement plan and request to stop any organised strimming of the pathway area by council workers. The key feature of this section is its position at the start at the north end of the footpath. This is important as it will be the first section that people will see and therefore creates the opportunity to show improvements and an example of things to come. The area extends for 30 metres with a width from 8.0m to 3.25m. The site has partial shade with a number of large trees overhanging the path. The soil is a mixture of leaf mould acidic soil and locally occurring clay soil. This area allows us to create an easy impact within a number of months. To create this impact I recommend using a selection of annual Wildflowers containing a mix of Corn Poppy, Cornflower and Corn Marigold. The seed mix will be broadcast sown in the areas both sides of the footpath and extending deeper across the full width where the soil area meets the Dean Villas house. Due to the shade from trees growth of the annual plants may be uneven. This area allows us to see which existing plants are growing by the footpath. In this area we can let plants grow and catalogue them and take seed or cuttings. The topsoil will be turned over and the existing perennial and biannual plants will be left. Seeds and cuttings maybe taken from these plants and used to re-populate other areas of the path. In the long term new local species will be added in this area. This includes areas that run along the existing wall and gives a great opportunity for tall shade tolerant species. Plants for this area will include Wild Foxglove, Great Mullein, Dark Mullein and Teasel. The Tarmac Path will be cleaned off with a stiff yard broom and water to remove years of old dirt. Drainage holes will be drilled where possible to reduce puddles. These drainage holes will be filled with loose gravel taken from the tarmac path. Initial exploratory holes will be needed to ascertain the depth of the path foundation. Throughout the year plants found growing will be added to the list.